Lt. Gov. Kathy Hochul (right) rallies the Democratic troops. With the opening of the polls less than a day away, party activists were at their headquarters this weekend, making sure their candidates win Tuesday. Two rooms: one in Cheektowaga, the other in Hamburg. Both rooms looked similar, with campaign signs, tables of people texting and emailing, making a last push to get their voters to the polls Tuesday. 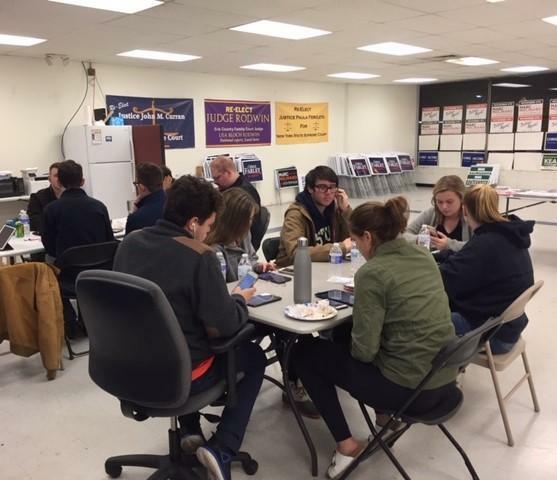 On Sunday, Republicans were at their Victory HQ in Cheektowaga, in a push that will continue until polls close Tuesday at 9 p.m. Republican Chairman Nick Langworthy was among them, but was not available for an interview. There also will be an election rally Monday 7 p.m.-9 p.m. at the Jamison Road Firehall. It will be an opportunity to meet and greet with local, county and state Republican candidates for office. Then after the polls close Tuesday evening, Republicans will gather at Embassy Suites in downtown Buffalo for what they hope will be an election victory party. Democrats had some firepower in town Sunday, as Lt. Gov. Kathy Hochul and state Attorney General candidate Tish James visited churches and party headquarters during a long sweeping day, from a 7:45 a.m. visit to True Bethel Baptist to a late afternoon campaign rally in Dunkirk. In her hometown of Hamburg, Hochul preached to the converted the message she wanted them to spread. "A lot of Republican women out there who are just saying, 'I don't recognize the Republican Party any more. They do not represent my health, my body or my daughter's future' and they're going to either come our way, which is great, or they're going to stay home, which is fine with me, or they're just going to pass over certain races, like Chris Collins," Hochul said. Hochul also praised other Democrats running for office. "Angela Marinucci. She will be the first woman to hold the seat of County Clerk since I left, which drives me nuts that no other woman has been elected countywide and Angela has far more credentials than we will ever know," Hochul said. "She is an individual who has a passion and an energy and a desire to make that office be the best that it can be. So I'm looking forward to her swearing-in as well." James used her talk to campaign workers to blast President Donald Trump and say Democrats and voters generally have a chance to send a message about whose country it is. The AG candidate made it clear she doesn't think it's the president's country. "Here we have a president who, unfortunately, after the murder of 11 individuals, decided it was all about him. After the murder of two individuals in Kentucky, it was all about him. It was all about him after elected officials received pipe bombs. It was all about him," James said. "It's not all about him. It's about healing our country and bringing us all together and recognizing that there's really nothing that separates you and I." The Erie County Clerk's office is ministerial, meaning most of what it does is processing paperwork and issuing documents, like DMV licenses of various sorts and gun permits. In a debate Tuesday night, incumbent Mickey Kearns and Democratic challenger Angela Marinucci agreed on a lot of things. Just two out of the three candidates in the 27th Congressional District race turned out for a debate Tuesday at St. Joseph's Collegiate Institute in Tonawanda. The final debate of the 2018 New York governor’s race - and the only upstate debate - was held Thursday night at the College of St. Rose in Albany and sponsored by the League of Women Voters. All of the candidates showed up except the incumbent.